For the second time this week, the defense in Vergara vs. California today turned to a teacher characterized as “ineffective” by a plaintiff in the case to show a starkly different picture. Vickie Decker, a middle school math teacher, refuted assertions by Jose Macias, the father of student plaintiff, Julia Macias, who had claimed in earlier testimony that Decker was harmful to his daughter’s education. Decker, who has spent nearly 20 years in the Los Angeles Unified School District, challenged those accusations, saying Julia had performed poorly in her class and did not accept her offers to help her with the work. Jose Macias had testified that Decker “demoralized” and “intimidated” his daughter, making her “afraid to ask questions,” prompting her to seek moving to a different class. Decker’s testimony is important to the defense — the state, the California Teachers Association (CTA) and the California Federation of Teachers (CFT) — in trying to show that students in the case had not suffered with ineffective teachers, and certainly not to the extent that five state laws governing teachers should be struck down. Beatriz Vergara, Julia Macias and seven other student-plaintiffs are trying to show that their own experiences are evidence of why laws on seniority, dismissals and tenure should be changed to help guarantee access to quality public education for all California students. In 2011, Decker taught Julia, then 13, at Lawrence Middle School for gifted students in Chatsworth. 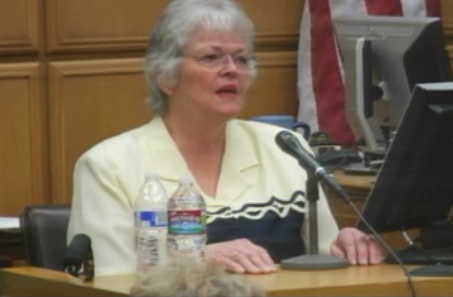 Attempting to undercut earlier testimony that described Decker as a non-caring, intimidating teacher, defense attorney Constance Hsaio asked her what assistance she offers her students struggling in math. Decker said she holds lunch workshops twice a week, and that she has an after-school, open-door policy. After meeting with Julia’s parents, Decker said she told them their daughter was welcome to get the help but couldn’t recall if Julia ever made it to any of the sessions. She also said she provides monthly progress reports to parents, and in Julia’s case, weekly updates. Hsaio then asked whether Julia returned all the weekly progress reports signed by her parents, as Decker required. She said Julia did not. Plaintiffs elected not to cross examine her. Earlier, plaintiffs’ attorney Marcellus McRae finished his cross examination of Jesse Rothstein, a professor of economics and labor at Cal-Berkeley called by the defense as an expert witness. McRae tried to demonstrate that Rothstein’s expertise and conclusions were limited and largely theoretical, as applied to California law and that alternative approaches to getting rid of ineffective teachers might be at least no worse, and maybe better, than current the current law. “You are not an expert on California goals with respect to public education, are you?” McRae asked Rothstein at one point.